Why Can't I View/Download My Detailed Campaign Reports? Do you love pouring over your email campaign reports? We sure do. And we know that you may be eager to dig into the stats from your latest campaign but sometimes you may hit a system roadblock. You may be prevented from viewing or downloading these reports. In this article we go through the reasons why your account may have had this functionality disabled. Why Can't I View or Download My Detailed Campaign Reports? How Long Do These Limitations Last? Please keep in mind that we continuously review all accounts and we will remove these limitations when we believe the account has remained in good standing for more than 60 days. If you're concerned about emailing subcribers who have hard bounced, registered a spam complaint against your account or have unsubscribed you don't have to worry about this. 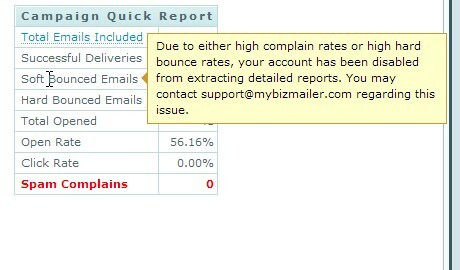 The MyBizMailer system ensures that these types of subscribers will not be emailed again from your account.